Alex Jones (Orion Pax) proves that Prince Adam isn’t the only one with “fabulous secret powers” with his latest nostalgic 1980’s project, The Masters of the Universe. 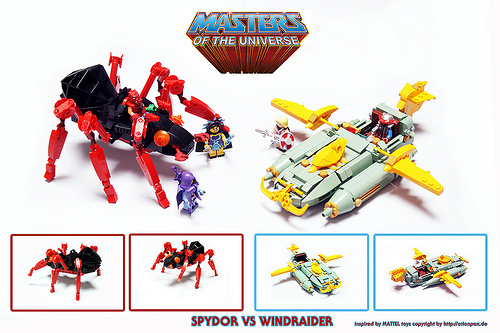 The latest installment in the series focuses on two vehicles the evil Spydor and the heroic Windraider. Alex brings his usual arsenal of weapons to the build including a wicked eye for detail and a willingness to go beyond the purist mindset. For more information on the Masters of the Universe project, head over to Mr. Jones’ website Orion Pax Designs for more He-Manliness. I’m not sure why, but every time I see a reference to He-Man, I’m reminded of the Village People. You can’t stop the music.